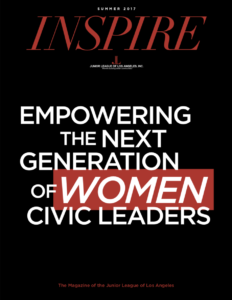 Inspire is the official publication of the Junior League of Los Angeles. The magazine’s mission is to share the latest in JLLA news with our membership, prospective members, community partners and donors. Inspire highlights for our readership our fundraisers and special events, the programs of our current and past community projects, and the strides our public policy council is making to affect change at the local, state, and national level on issues that concern our focus areas of women and children. If you are interested in placing an ad in Inspire, please refer to our ad sales sheet. If you have any questions, please contact us at InspireMagazine@jlla.org.